Dear friends, it is my honor to bring you this unique and thoughtful writing desk. This Home & Office writing desk in white/black is designed for space saving and modern stylish look. Clean lines, smooth and square desktop with trestle wooden leg, widely open and adjustable shelves at the bottom, asymmetrical and angular design. Three-dimensional sense of space and more study embedded screw design matched with beauty magic sticker, give this writing desk its unique contemporary style. Perfect for use in home, the study, office or at the corner and more. Could be used as a writing desk, workstation, computer/laptop table etc. Dimension of the whole writing desk: 119.5*51*73.5 cm(L×W×H), 47*20.1*28.9 inch(L×W×H), more details are showed in the pic. With our step-by-step instructions, it's easy to assemble this writing desk. If there is any questions plz feel free to contact with us, our experienced customer service team will response in 24 hours. Have fun with it. Computer Writing Desk --- 2 WIDELY OPEN AND ADJUSTABLE SIDE SHELVES: Provide plenty of space for books, printers, bags, computer components or other essential office supplies. Computer Writing Desk --- EASY TO ASSEMBLE AND CLEAN: Step-by-step instructions and easy assembly tools provided. Smooth 3D stereo wooden table top and widely open design at the bottom, can get completely dirty cleaning. Computer Writing Desk --- 280lbs LOADING CAPACITY STURDY DESK: Super thick high density board and large desk top surface with 25mm thicken panel to get better sturdy, 15mm high density exposed chipboard under the table top to show our environmental raw material. 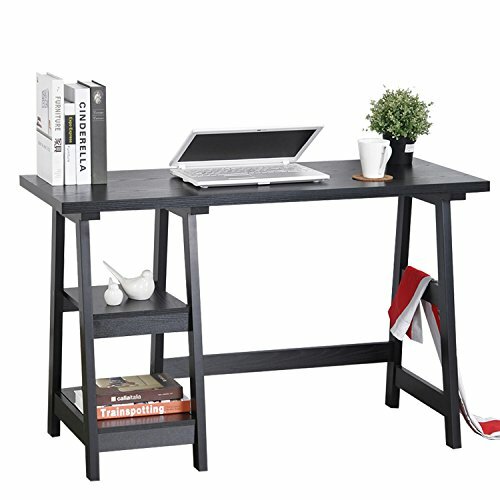 Computer Writing Desk --- EXTRA-LARGE LEG STRETCHING SPACE UNDER DESK: Space size(L*W*H): 28*17.3*29 inch, you can stretch your legs freely and comfortably after a long time working. Also can put your legs on the horizontal bottom supporting board to get better rest. Computer Writing Desk --- WARRANTY AND SERVICE: You can return the item within 30 days with no reason, and we have 3 years warranty for this item. Any problem, contact with us by email directly, we will give response within 24 hours.